The Elder used to come to the vigils of our Monastery and would sit in a stall across from our domestic icon, the Awesome Protection. The brothers would also visit him regularly, and of course many pilgrims that were hosted by our Monastery. However, for a period of forty days – it was the year where he had the first symptoms of cancer - he would not appear when people would come by. He neither opened the door to his hut nor did he show us a sign that he was alive. This worried us. One day I decided to go by myself to his hut. I knocked on the door but received no response. I managed, though, to force myself in. Even though I had arrived anxious, I strangely felt an unidentifiable and inexplicable calm the moment I had entered. I took some grapes. They had the color of Rhodian grapes, with a particular taste and aroma that I had not known before. "Elder, what was the Panagia like?" I asked. Supporting himself, and with great difficulty, he got up to bring me a small framed icon. 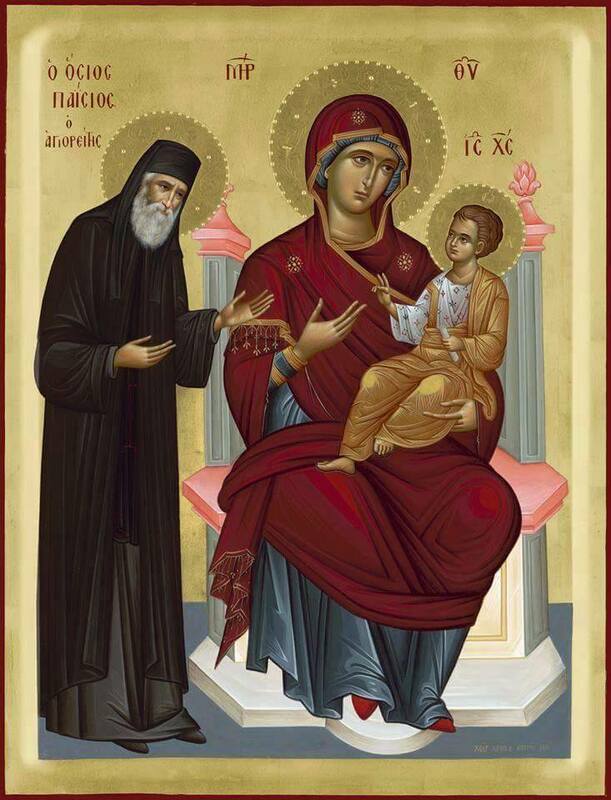 It was the Panagia the Jerusalemite. "She always appears as the Jerusalemite," he said to me. We talked for a little while longer and I then left him in peace, because I judged that at times like those, one must not be intrusive. From the book The Presence of Monasticism in the Contemporary World (Η παρουσία του Μοναχισμού στον σύγχρονο κόσμο). Translated by John Sanidopoulos.